We improve your website’s conversions and profit. We use a process known as A/B Split Testing. A/B Split Testing is where we make a variation of your webpage that we believe will convert visitors into paying customers better than your current page. 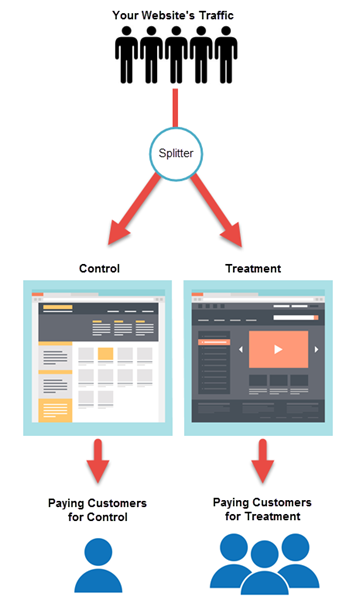 We then set something up called a “splitter” which will randomly split users to both your old page (control) and the new page (treatment). So roughly 50% of your traffic will see the old page, and 50% will see the new page. We then measure the difference in performance between the two pages. The goal is to get the treatment page to convert at a higher % than the control page. A/B Split Tests can test numerous amount of things including headlines, call to action, layout, or a completely different page which we refer to as a “radical redesign”. How do you know what/where to test? We have a systematic approach where we analyze where testing will help you most. As far as what to test, we have literally seen thousands of tests. From this we have developed our own best practices and will know what things on your site can be adjusted to see maximum impact. For more information on this, see our methodology. Do you offer services for small businesses too? Are they different than what you do for bigger businesses? Absolutely we offer services for small businesses! When possible we use the same A/B Split Testing strategy. However, a common problem among small businesses is small traffic levels – compared to the bigger guys. Can we test with small amounts of traffic? Yes. However, to get you the most bang for your buck, some small business might be more benefited by having us redesign your site based off of best practices. We have seen thousands of tests, and we normally have a very good idea of what will work best. Contact us and we can discuss things further!